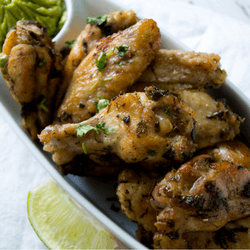 Easy and delicious, these wings will delight the whole family! In a large bowl, mix all ingredients except the chicken wings. Add the wings and toss until they are completely coated with the marinade. Place chicken on a baking pan. Cook for 45 minutes, or until desired level of crunchiness is achieved. Top with additional cilantro if desired, serve.